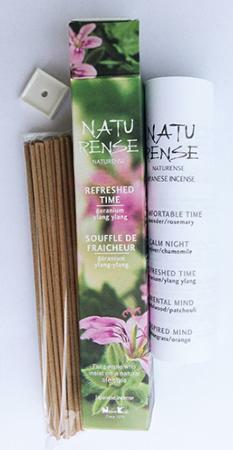 The fragrance of the natural oils of Geranium and Ylang-Ylang - for those who need to feel refreshed. A deeply floral and feminine fragrance, the top notes coming from Geranium, supported very nicely with the ylang-ylang. The overall impression from these sticks is uplifting, positive, green and refreshing. Ideal to 'listen to' when you're already in a good mood - this will make this positive experience even better! Great as a background fragrance whilst studying, to keep your mind sharp. The Naturense range (of 5 varieties*) from Nippon Kodo is for people who know exactly what they like and believe in a natural lifestyle. This line caters to those who not only enjoy nice fragrances but also pay attention to the ingredients. All varieties in this range use high quality, pure natural oils, which are added to a neutral wood base. * Vectis Karma stock all 5 varieties in Nippon Kodo's Naturense range: Comfortable Time, Calm Night, Refreshed Time, Oriental Mind and Inspired Mind. A richly scented (without being overpowering), low smoke incense with none of the "burning wood" issues I have experienced with other/lower quality brands. The stated burn time of between 30 - 35 minutes is accurate and suits my needs perfectly. The scent lingers for a good while after burning and the inclusion of a small ceramic stick holder is a nice touch that other manufacturers should take notice of.